I know I'm not the only person who heard Robin Thicke's summer smash "Blurred Lines" and immediately thought of Marvin Gaye's "Got to Give It Up." You can say what you want to say, but you have to admit the songs have a similiar feel to them. I guess the family of Marvin Gaye must have heard the same thing that a lot of people were hearing because evidently they threatened to sue Thicke as well a the records contributors Pharrell and T.I. So in order to counteract the Gaye's family claim, the trio decided to do a preemptivie strike and sue Marvin Gaye's family instead. In order to shield "Blurred Lines," the hottest hit of the summer, Robin Thicke, Pharrell Williams and Clifford Harris, Jr. are going to court. A lawsuit was filed Thursday in California federal court by the trio against Marvin Gaye's family and Bridgeport Music, which owns some of Funkadelic's compositions. 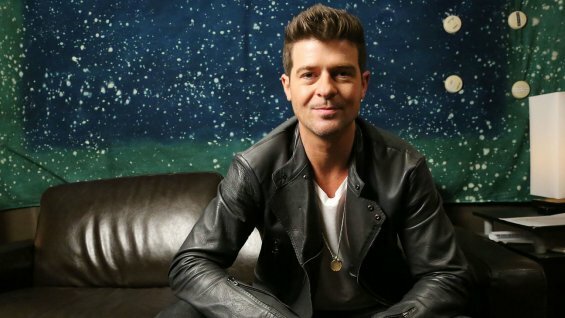 At issue are complaints about similarities between "Blurred Lines" and at least two songs. According to the suit, a copy of which was obtained by The Hollywood Reporter, "Plaintiffs, who have the utmost respect for and admiration of Marvin Gaye, Funkadelic and their musical legacies, reluctantly file this action in the face of multiple adverse claims from alleged successors in interest to those artists. Defendants continue to insist that plaintiffs' massively successful composition, 'Blurred Lines,' copies 'their' compositions." A New York TImes critic has noted that "Blurred Lines" is "influenced heavily" by Gaye’s “Got to Give It Up,” but the lawsuit makes the point that "being reminiscent of a 'sound' is not copyright infringement. The intent in producing 'Blurred Lines' was to evoke an era." The Gayes and Bridgeport are said to be threatening litigation should the plaintiffs not pay a monetary settlement. Rather than wait for such a lawsuit to proceed, the plaintiffs are going to court to determine the parties' respective rights and obligations. In seeking a judgment, Thicke, Williams and Harris Jr. are not only looking for a declaration that their song doesn't violate the defendants' rights by copying their songs, but also that the "Gayes do not have an interest in the copyright to the composition 'Got To Give It Up' sufficient to confer standing on them to pursue claims of infringement of that composition." Personally, I think this lawsuit is going to backfire on Thicke and co. for the simple fact there is a long history in this country of white artists stealing music from black artists and the black artists never being compensated. Robin Thicke may win his case on legal grounds, but he may also alienate one of his largest fanbases in the process. Some people call it inspiration, I call it stealing. What do you think? Please listen to both songs and tell me what you think. The Bass lines and cadence are some what similar, but it's not copyright infringement. I think the preemptive strike is a cleaver legal/business move. As for the history of white artists stealing and profiting off the music of black artists, that's really not the case here. Pharrell produced this track with Thicke and is making MAD money off it too. I guess settling would set some type of precedent because there would be a slew of similar lawsuits because of the "similarities" out there. It would be a nice gesture to monetarily recognize Marvin Gaye as the "inspiration."